1 Can 2 Can is a wordplay that introduces the stars of this video slot. Indeed, 1 Can 2 Can video slot action takes place at the heart of a tropical island. And toucans will team up to the sounds of steel drums to help you win big. In short, the action of this game focuses on birds randomly flying over the reels to replace fruit symbols by Wilds and Scatters. And all that, while a good tropical tune plays in the background of this jungle theme slot. All and all, 1 Can 2 Can is an entertaining and colorful game. Plus, very much like most NExtGen games, it offers a great balance of features and a smooth gameplay on any devices. So why not take a break from the hustle and bustle? Escape for a moment in a tropical paradise and have fun at any casinos listed below. How to trigger the bonus features of 1 Can 2 Can video slot? To sum up, there are two features you can trigger in this game. The Free Spins bonus game. First, if you wanted to activate the Free Spins game, you’ll need 3 or more Scatter symbols. In 1 Can 2 Can, the Scatter is easy to spot since it has the word “SCATTER” written on it. And, the chances are you’ll see this symbol often on the reels since it can appear on all 5 Reels, unlike other games. In short, landing 3 Scatter Symbols will give you 10 Free Spins. 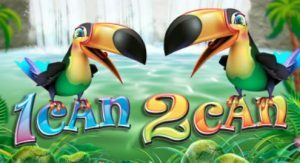 When the Free Spins bonus start, make sure to keep a close eye on the left and right toucans sitting on a branch by the reels. You’ll see them flying randomly over the reels, and they’ll add extra Wilds and extra Scatters. Which means, you can both win big and re-trigger the bonus feature. In short, you can activate the gamble your winnings game at any time after a win in the main game. Generally speaking, It’s a useful feature to try if you’re looking to double-up or quadruple-up small wins! In essence, in this game, you’ll need to predict the color or the suit of a hidden card. So you stand a 50/50 chance to double-up or a 1 in 4 chances to quadruple-up what you’ve gambled. Why should you play 1 Can 2 Can video slot? 1 Can 2 Can is a fun slot to play and it’ll put a smile on your face! Not to mention that the gameplay is very straightforward and this game has many crowd pleasing features. Overall, we think all levels of players will enjoy this slot especially if played with a casino bonus. So, head over to Golden Nugget Casino and try it out! Have fun!